First of all i have to admit that i'v never been a fan of any sports animation/movie. They tend to always annoy me with their cliché progression and monotone script. I actually started watching this out of pure boredom when i could not sleep one day and boy did i not expect this! I didn't even had to watch more then a couple of minutes to completely change my mind about this anime. It took me by such surprise that i still don't really know why it left me with such joy to watch the next episode. The plot is actually clever and the characters, yea the characters are so central to the story that, i guess they carry the show alone with their multi-layer personalities.I'v only watched 2 episodes so far, but these two episodes have created a perfect ground for upcoming parts to shine. Never mind the odd art choice, never mind the sport theme, this is something i will follow with excitement for the upcoming months. Have now watched all the episodes and there is not much more to say. I got used to the aesthetics for a start, but everything else just followed. This series was made with a lot of care and passion that shines through to the viewer. The story seamlessly flows through the episodes without a single hick-up and i'm just amazed by how charming and satisfactory "The ping pong animation" turned out to be. The animation (not the style/aesthetics) itself is actually really good and impressive, something rarely see on modern anime's these days where the perfection of graphical detail seems to be the main focus. It's really beyond me how they actually could make such a complete anime with ping pong as it's main focus and somewhere here I have to realize that this anime is so much more then just "An anime about ping pong". Never have I felt characters more relatable than the whole ensemble of Ping Pong. I have seen this anime about 30 times now, tonight it will be 31. It is a show that should be watched over and over. It is a show that motivates me to carry on. It is a show that teaches me to believe in myself. It is a show that teaches me to have fun. It is a tragedy many will ignore the show because of its off beat animation, because as the 2015 Animation of the Year in Tokyo Anime Award Festival, it is one of the highlights in the medium. This is, without hyperbole, one of the greatest sports stories told in any medium. Yet, underneath the story of what it means to dedicate yourself to a sport, this is an anime about being human and the repercussions of living in a highly competitive world. It is also a brilliantly observed character study. Don't be put off by the art style. By the end of the series, you will come to see its unique beauty in an industry that is often saturated by copycat styles. Great story with fresh style. Before watching this anime I had seen the movie Ping Pong(2002) but I never read the manga. The movie wasn't bad at all but this anime better. The story is deep enough to drown in. The animation style is fresh & interesting. There is a lot of fast paced animated action that is beautifully cut. I might be a sucker for sports anime but I would still HIGHLY recommend this anime to anybody. It's not just about table tennis. After my 372nd rewatch, I finally decided to write a 5 star review. The reason that this took me so long is that every time I went to write this review, I just ended up watching the first episode again and the cycle didn't break until my laptop charger burned out from charging 2306.4 hours in a row. So now I'm here to toot the golden anime horn before my laptop dies. There's a reason this show is all 5 stars. Watch it. Now that this is over with, time to watch it again on me phone. ping pong the animation is a phenomenal piece of art bursting with life. a captivating commentary on competition, friendship, childhood, and individuality, the story is sewn together with outstanding flair. incredibly fun but genuine; an absolute must-watch. Okay so, I'm sports anime trash. Haikyuu is my fave, but I've seen a lot of them, and sports anime is by far my favorite genre. I'd heard this anime was good, but I never got around to watching it for what, four years? Oops. Anyway, I figured I'd give it a go since like I said, I adore sports anime, and once I saw the five star rating I had high hopes for this show. The art style threw me off a bit at first, since it's so unlike the standard for sports anime. But then again, pretty much every aspect of Ping Pong is like that - the characterization, the overall portrayal of the sport, the length of the show itself, even. If you're into sports anime like I am, don't expect the typical experience that most of these shows give you. Since I've seen Haikyuu like, six times (I told you I love it), I was basing most of my expectations off of that, and wow was this a totally different animal. Whereas in most sports anime, a single match/game can last for several episodes, Ping Pong finishes entire tournaments with just one. And the style is different, obviously, so that shows a lot in the matches as well. There's a lot of splicing, a lot of implied action, which is the opposite of what most people think of when they think sports anime. Same with the characters; the story is less about their journey with ping pong and more about their personalities, and growing into themselves. A lot of sports anime has some element of that, because it's necessary in any media, but character development plays a much larger role in Ping Pong than most other shows of the same genre. I could go on, but I feel like I'm already rambling so I'll leave it at that. This show is incredibly underrated, and I think everyone should watch it - whether you're sports anime trash like me, or you enjoy shows with unique artistic styles, or you just really want to see some quality character development. It's got something for everybody. Plus, it's not too long, so you can binge it all at once and really make yourself emotional. Ping Pong the Animation I started watching because it was recommended to me by a friend. I'm still a bit new to anime and the community, so I haven't really learned to adapt to new art styles, so when I first saw the character design I found it odd. Now that I've finished the series I've realized that I found it odd because there is absolutely nothing like it. 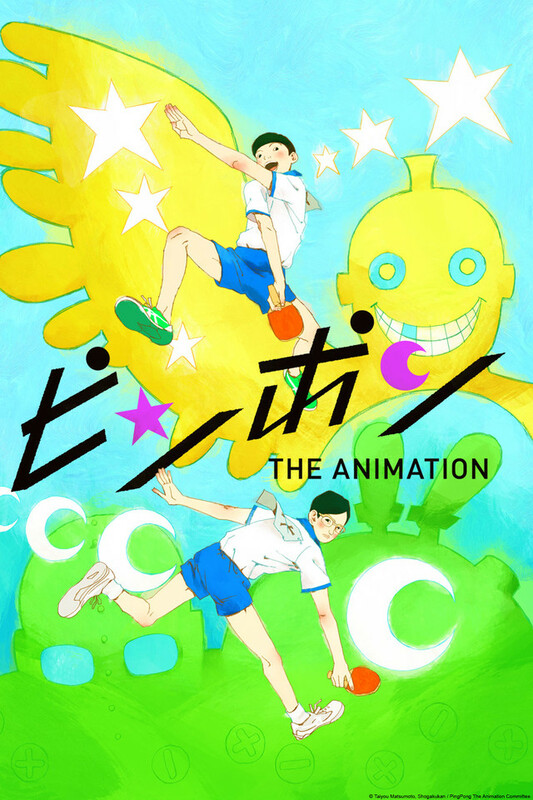 Most animation specific anime (from my experience) is mostly about the art and the animation, but Ping Pong the Animation had everything you could possibly want from an anime. The voice acting is terrific, with lively, real-sounding characters; the story is great, but sadly only has 11 episodes, and what really stands out is the animation. While watching this show it actually reminded me of the Action genre, although being a Sports genre. The animation is so intense that a single hit of the ball can be drawn out for two whole minutes and still be interesting because there'll be flashbacks for that one specific ball hit that wouldn't have fit with any other part of the entire series. If I were to nitpick at this anime a little bit (I mean you should be able to, nothing's perfect), is that they do use similar or the same flashbacks multiple times in the series, but in my opinion that's a good thing, because it gives you nostalgia and remember all these other things you were introduced to. If you're reading this review as a recommendation as whether to watch this or not; even if you aren't into ping pong or even sports, give this one a watch. 11/10 without a doubt. Masterpiece. We are all alive. Ping Pong the Animation is one of my top 3 anime shows of all time. The show revolves around table tennis, but it is not really about details of the sport, because this show is all about the characters. This quite possibly the best cast of characters I've seen in anime besides shows like Cowboy Bebop, Hunter x Hunter, and Shouwa Genroku Rakugo Shinju. We find each character at a different point in each of their life, and given a thought out backstory. We learn about the reasons each character plays ping pong, what they play for, what it means to them, how they learn about themselves through it and the interactions with fellow players. We also see the different generations of players and coaches. It story redefines what friendship means. The art style and animation is somewhat uncommon in anime but accentuates the way the story is told. The music gave me goosebumps at the right moments. The characters, well... it is all about the characters, and you will end up rooting for everybody. Ping Pong the Animation is masterclass in the way it told a story in one cour. Let's just say there was even a beautiful scene presented so perfectly that i suddenly felt warm tears streaming down my face before I even realize I started crying.